When I posted this pic the other week in my Salamander Commander conversion, I got a question from Mike over at Santa Cruz Warhammer about how I sculpted the shoulderpad on the far left (the circle with laurel under it). Over the past year, I've sculpted a number of shoulderpads, from the simple to the complex. Actually, both of those were complex ones despite looking relatively easy in the end. Regardless, it all comes down to understanding the object and breaking it down into smaller shapes that fit together and/or overlap. We'll go back to the original one I got the question about. I start with a blank shoulderpad. On that, I add a small, round blob of greenstuff in the center and start to press it down and outward. As I get close to the shoulderpad trim, I cut it (the excess greenstuff) away. The reason I don't press it all the way down and let it flow over the edges of the shoulderpad is because I'll lose my bearings and not keep a circle in the center. If I press down a little and then trim away a little, it becomes a series of small adjustments I make instead of one sweeping cut and hoping for the best. Remember, this circle needs to be centered but high enough to allow the laurel underneath. As you press it down, pay attention to the thickness of your circle along the edge where you cut away the excess. You want a consistent thickness around the whole edge. If you need to peel it up and start over, then do what it takes. Spending a few minutes on the front end pays dividends in the end... especially if you're doing something like casting. Getting the surface of the greenstuff smooth is easy enough, a wet finger tip does the job just fine. Just watch your pressure so you don't leave any fingerprints. LET IT CURE COMPLETELY BEFORE MOVING ON. Stop, go back and read that last sentence again. If you think you're going to have trouble with this particular step, you need to rethink sculpting to be honest. Patience is perhaps the biggest sinlge thing you need to have when it comes to sculpting. So let's move on. With the circle sculpted and cured, we move onto the laurel itself. There are lots of ways to sculpt things. I'm going to go with a real simple approach here that doesn't require any complicated math or measuring or the moon and stars being lined up just right. We're looking for a suggestion of a laurel here, we don't need to sculpt each individual leaf. Now you do the same thing for each side of the laurel. Once you have both sides done and they've cured, you can add a tiny ball of greenstuff to the center of the laurel and flatten it out to get the center gem/medallion in there if you want. Lay a thin length of greenstuff starting at the bottom (in the center) and going up one side. Cut the top off where you want it to stop. Press down the greenstuff and flatten it slightly in position. Cut a groove down the center of the flattened greenstuff. Don't drag your tool in this step since it may "pull" the greenstuff out of shape. Just make nice single line indentation up the middle. Press a series of smaller grooves along each side of the center line. 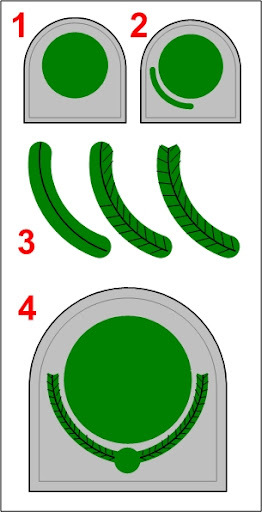 These will represent the leaves. When you get to the top, you can cut a wedge out of the top to give the illusion of leaves. It's not necessary, but it helps make it look convincing. This isn't really a step, just clean up any edges that catch your attention, and that's not even a "have to" do either. Make sure both sides of the laurel line up and look the same, you don't want it to be lopsided. That's it really, simple as that. I will say that as you do more and more sculpting, you'll develop an idea of what's going to happen to the greenstuff before you cut it and you'll learn how much pressure to apply and in what position you need to hold the blade exactly and so on to get what you want the first time. I don't think this kind of thing can be taught, it's something I've just sort of learned as I've gone along with my sculpting. When I started, what used to take me three or four attempts with numerous cuts and fixing-up now is done on the first or second try. Really really impressive. How long did the Ultramarine Symbol take you? The Salamander head? IC: It is easy, as long as you break it down into shapes and you're patient. 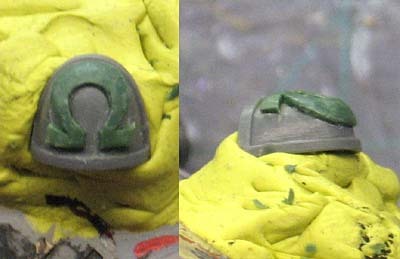 The Ultramarine symbol took about 40 minutes total (not including cure time) since I had to sculpt the U shape separate from the the two straight end pieces. The Salamander head went quicker at about 20 minutes since it's all done in one pass. It's all in how you look at it. Like painting a model, you break that down into colors and layers and such... same for sculpting. Seriously that's very nice work. Would it be worth making one pad and then casting your own from white metal or resin? I've often wondered if that's viable. Roll With It: That is true, it is upside down. It's actually for an Omega Marine army if memory serves me correct. As for casting, if you had the ability to do it, I'm sure it could be helpful depending on how many you needed for your army. I've got 11 guys in my army total so I'm not at the point where I need to cast just yet. Sometimes you need to be careful if you're sculpting something for casting so that you don't end up with something that is terribly difficult to use. Great sculpting work as always, you make it seem easy, but you have great talent. As you say breaking it down into smaller tasks is key for me as well, as is practice, it takes me a few times to get it down to a nice shoulder pad size. 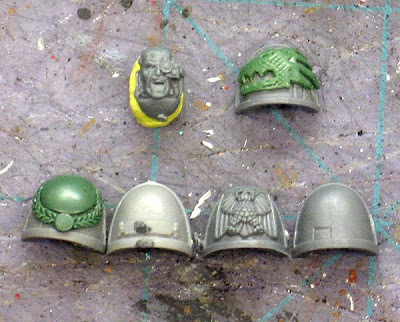 Casting in resin is simple, fun and inexpensive also easy to do at home and great for lots of troops. I do however like the variation you can do when sculpting each individually, but it's very time consuming. 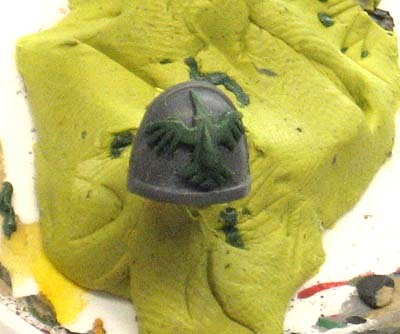 Mold positioning for shoulder pads can help with undercut issues, as does a dash of baby powder as it helps the resin move in the mold and fill in air gaps. If you get a particularly tough undercut you can even push the resin around with a toothpick and get good results. You would be surprised what kind of quality can come out of a simple 1 part mold with a bit of tweeking. SC John: One day I might try my hand at it (casting that is). I've heard from some other folks that it's fairly easy to do and once you get the hang of it, you can make anything you want. ron, this is just what I was waiting for. Thanks for the explanations. More coming I hope? Mike: No problem, sorry it took me so long to get done. I'm trying to get better at recording stuff as I do it so if there's something that interests you, just let me know. Thanks for the post- I'm looking forward to expanding the concepts to my own projects. Max: Glad it could help. Hopefully you can put it to good use.